Supermarine Spitfire LF Mark IXEs, of 'B' Flight, No 443 Squadron RCAF, parked in a dispersal surfaced with pierced steel planks (PSP), at B114/Diepholz, Germany. A pair of Supermarine Spitfire Mark IXs of No. 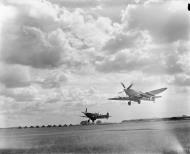 443 Squadron RCAF take off from Ford, Sussex, for a sortie over Normandy. Both aircraft each carry a 44-gallon long-range fuel tank under the fuselage to extend the Spitfire's range over the continent.